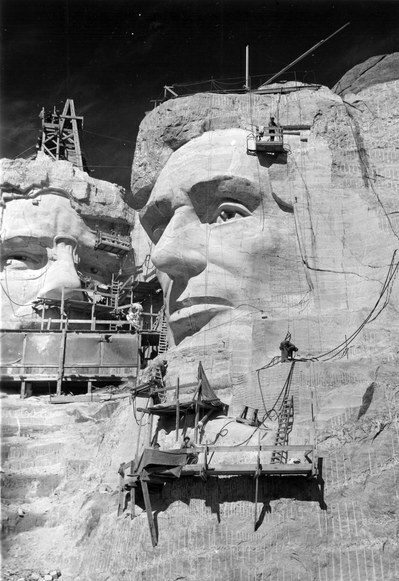 At 60 feet, the face of Abraham Lincoln on Mount Rushmore National Memorial is South Dakota’s largest connection to the nation’s 16th president. Sculptor Gutzon Borglum carved four giants of American history in the granite of Mount Rushmore as a tribute to the spirit and ideals of the United States. Lincoln represented the preservation of the nation. Lincoln was the third president carved on Mount Rushmore, joining George Washington and Thomas Jefferson. Theodore Roosevelt’s would be the fourth face added. Lincoln’s face on Mount Rushmore is by no means South Dakota’s only connection to the Great Emancipator. The Mentor Graham house in Blunt is another link. Graham was born about 1800 and reared in Green County, Ky. He met Lincoln in New Salem, Ill., and was Lincoln’s tutor for surveying and grammar. At age 83, Graham and a son left Illinois to homestead near Blunt. Graham died in 1886 at Blunt. Lincoln appointed the first two governors of Dakota Territory while he served as president from 1861 to 1865. William Jayne, the Lincoln family’s physician in Springfield, Ill., served as territorial governor from 1861 to 1863. Lincoln appointed Newton Edmunds as the second territorial governor in 1863. Yankton was the first territorial capital. One of the founders of Yankton was John Blair Smith Todd, a cousin of Mary Todd Lincoln, the president’s wife. Todd came to Fort Randall as an Army captain. He resigned his Army commission in 1855 to capitalize on what he believed would be a frontier boom. Todd served as the territory’s first delegate to Congress. Edmunds, Todd and Lincoln all had counties in South Dakota named after them, and countless schools bear the name of the 16th president. By writing Abraham Lincoln as part of the American Presidents series, George McGovern added to the body of work written about Lincoln. He also strengthened South Dakota’s link to Lincoln. McGovern represented South Dakota in the US Senate from 1963 to 1981. In studying Lincoln’s life, people can see how a person can rise from humble beginnings and struggle through disappointments to attain the highest elected office in the nation. People can examine what Lincoln made of his life and wonder what they can make of their own, McGovern stated in his book.